Order this Glorious Warm Spring Evening Arrangement and make your dear ones happy. 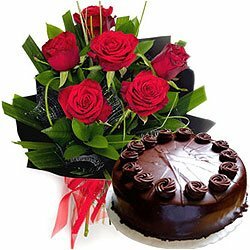 This sophisticated composition includes Chocolate Cake and 6 Red Roses Bunch. Order online this Fragrant the Pinnacle of Beauty Floral N Cake Selection for the people who deserve your love and special attention. Enjoy this Selection which is arranged with 1 Kg Chocolate Cake and 6 Red Roses Bouquet.